Designed for secure belt fixing, the Fast Response First Aid Belt Wallet (Empty) is the ideal resource for the trained first aider to easily carry around essential safety provisions to quickly assist themselves and others. The Fast Response Belt Wallet is easily fitted onto an individual using a simple belt-loop attachment, making it discreet to carry around but easy to reach during times of emergency. The Velcro fastenings are also advantageous for quickly accessing the contents of the kit, while easily securing back into place when finished. This belt attachment is the perfect home for essential items like resuscitation shields, gloves, aprons and many other disposable products. Responders can always be confident in having at hand the means to protect themselves while administering first aid to others. The material is made from an extremely durable fabric, constructed in a clever tool bag fold design. The numerous internal features and storage options in this pouch make it a necessary item for all those first aiders who are constantly out and about. Please be aware that the Fast Response Firt Aid Belt Wallet is supplied empty and first aid products must be purchased separately. 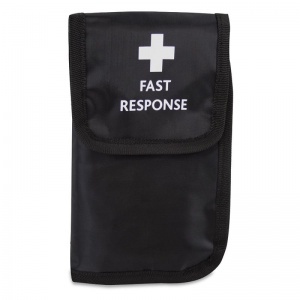 The Fast Response First Aid Belt Wallet (Empty) is usually dispatched via First Class Royal Mail and delivery should be within 1 to 3 working days.